Back on the road again after the short winter break. Short winter break? OK, it has felt like a good break courtesy of a family Christmas down at Dartmoor and hasn't felt like winter because the weather has been kind. 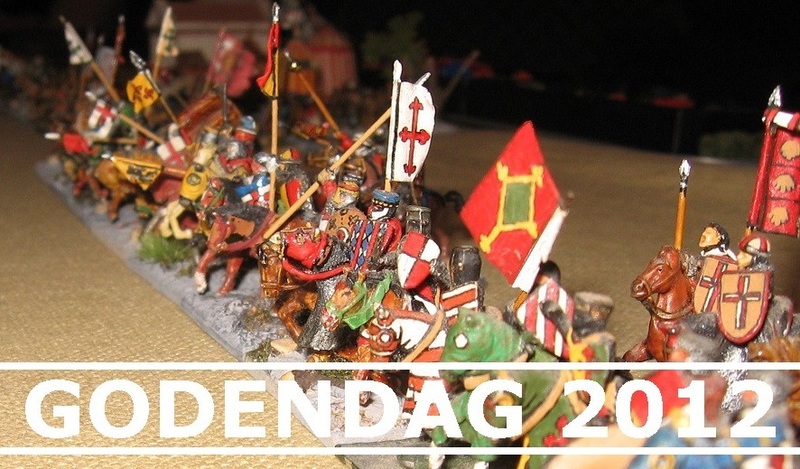 FoG-R seems to haved tapped into this less exploited vein of military history, and at events like Godendag has attracted player numbers not at all typical of previous tournament offerings (say, DBR). 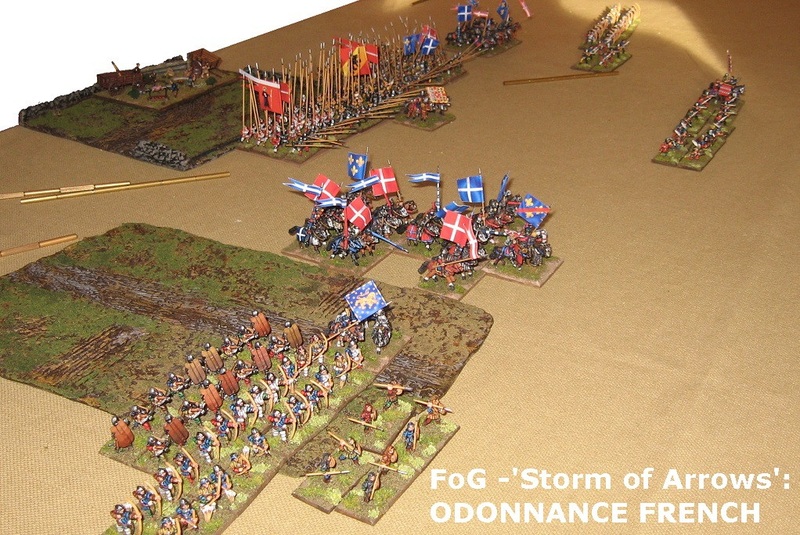 At Godendag, FoG-AM (Ancient and Medieval) needed to combine its player numbers (20 teams) with DBM (12 teams) to keep 'ancients' ahead in popularity. FoG-R with 24 teams was the single most popular choice. 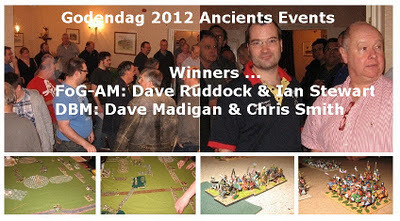 Astute mathematicians will have come to their own tally already :) ... Over 100 people playing Ancient to Renaissance wargames for a wet January weekend in south Wales ... indeed you can't doubt how healthy and appealing this sort of thing is. Choice of periods for the AM category gave us a free run at the medieval period and we picked with moist eye rather than a cynical mind, maybe. 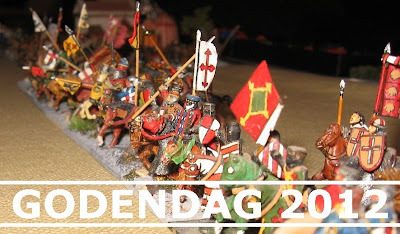 The good news about my old Feudal Spanish (7th edition and DBM veteran) Aragonese is that, resplendent in its 11th century FoG version, it has won its last 5 engagements (including a whole day of decisive bonus wins that earned it a pot in Halifax ...) ... The not so good news is that (only Armoured in FoG) it can easily get found out by heavily armoured troops (like most of the entrants you might expect in this event), and its principal skirmish weapon - the javelin or dart - needs careful handling (or a bit of luck, like we got in Halifax) to bring any advantage. OK - that's a bit pompous: the risk is there will be plenty of troops who can outrun us, plenty of troops who can out fight us, plenty of troops who can outshoot us, and plenty of armies that will outnumber us. 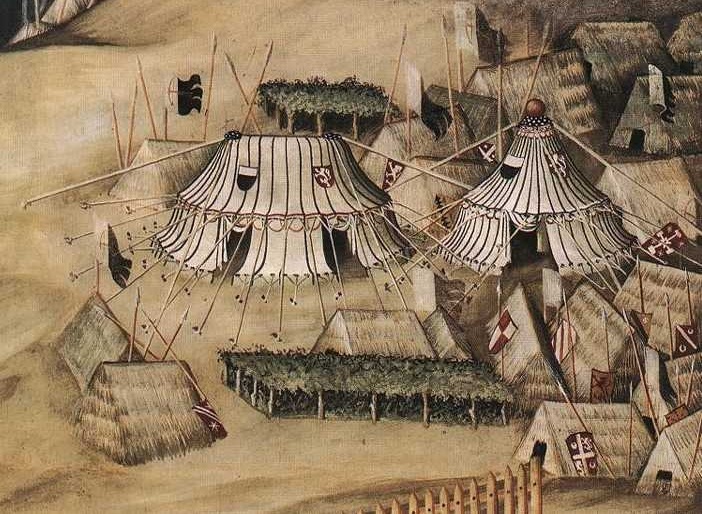 Feudal Aragonese have an endless will to fight but have top trumps in no department! Day One hamstrung us. Because of date, we got drawn against one of two identical Xi Xia armies (of that sort that dismounts almost everything if it wants to). 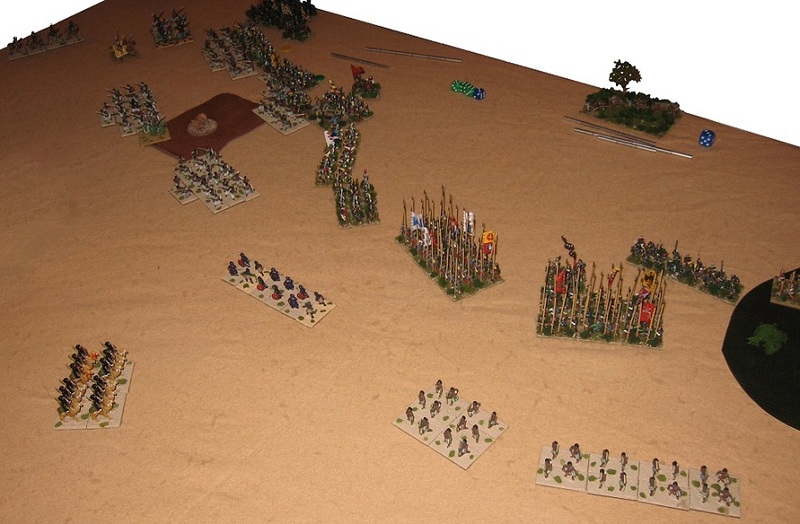 It did dismount (despite having an armour advantage), and using IC initiative, then turned the battlefield into a cabbage patch (further protecting its dismounted troops from any mounted threat). 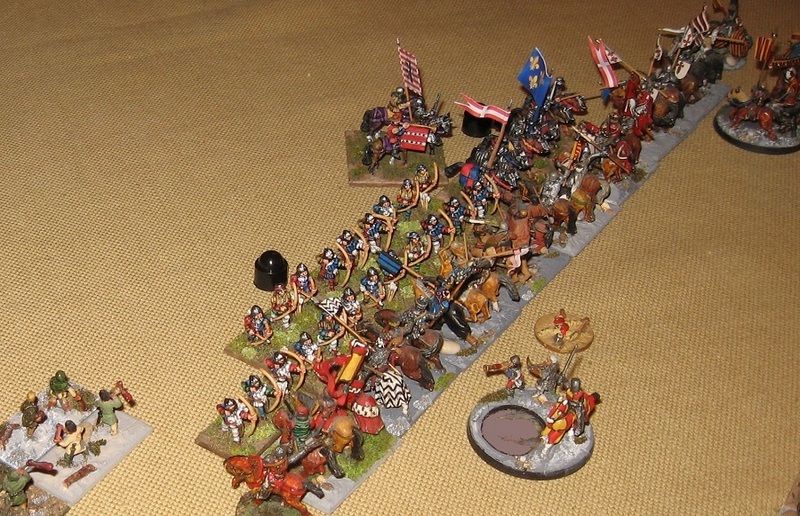 It looked like a stalemate strategy, and despite our best efforts, turned out to be so - a marginal defeat by a point. Sadly, the other Xi Xia (which was a pair who had split to even the draw, and had duplicated their army to do so) used the same tactic with the same results. That made them odds on to draw us in the next round. And they did. And out came the same cabbage patch and dismounts - and the same stalemate ensued. Two perfectly good games of their sort. Less ambitious than I like, but the whole point of these events is to embrace challenges that are not always played your way. I am a bit grumpy though, as the consequence of the Xi Xia split was that the same game/army was in the draw twice. And the procedure generally follows that you shouldn't get the same game twice. But we did. Perfectly good players but we didn't get our fair share of variety. Sunday morning brought us a Latin Greek conundrum ... did they have Catalan allies? If they didn't we were probably going to face overwhelming numbers of knights who were more heavily armoured than our own. If they did, we were probably going to be confronted by another cabbage patch (and another draw). As soon as the terrain process began it was clear that it was the cabbage patch. Of course, I have no problem with Aragonese vs Catalans, but having used Latin Greek myself, I think it needs to fight in the open to get a big result. 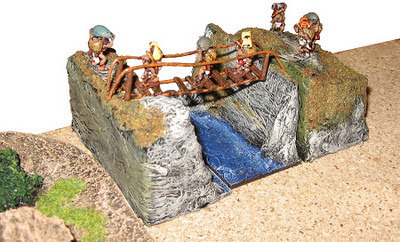 Unfortunately the terrain dice gave us another oversized compulsory piece slap in the middle of the table. What are the chances of that I hear you ask ... well around 1:6 actually (they get middle/we can't shift it much) but like all long shots, it slowed up all of the first three games. 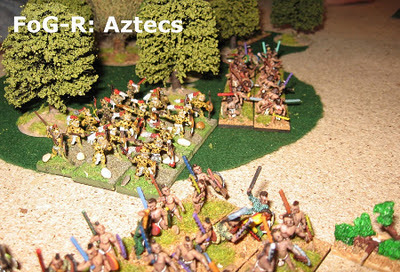 Players, of course, think about their own armies and look to manipulate the terrain system to gain an edge. A fault of the ex-WRG terrain system FoG continues with. 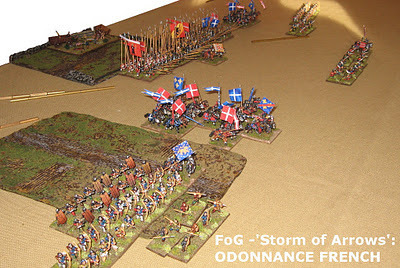 I'd just say that - against an Aragonese army a third of which is javelin skirmisher - churning up the middle of the table with dodgy terrain is a good way not to get a result. 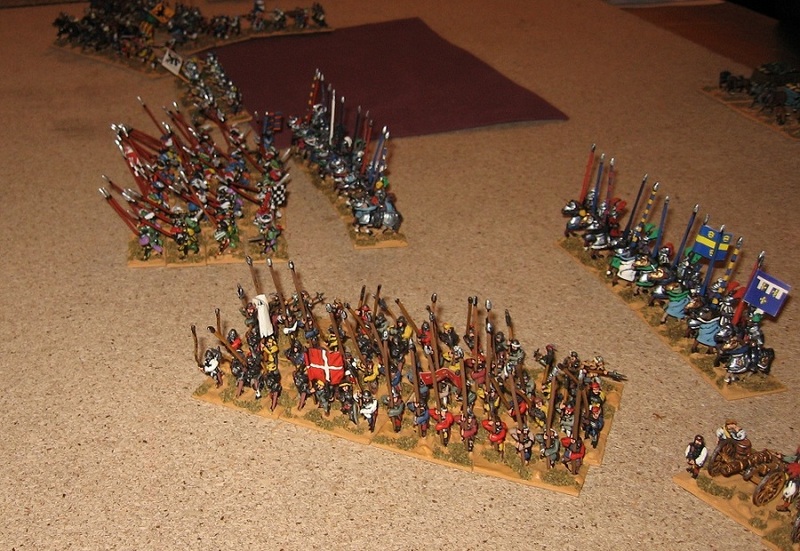 Finally, against a French army that wanted to get at us, in Game 4, battle was joined across a relatively open field - and, despite their better armour and nasty looking Switzers, good prospects of a result. Skirmishing against them was hard work and we took some initial shocks from the new technology of their hand gunners. 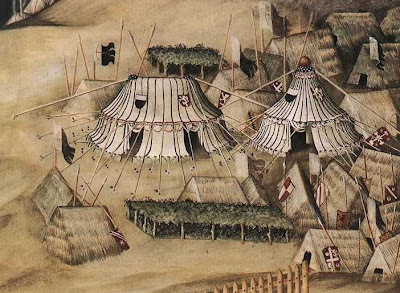 We recovered and set about them with sticks and stones, chasing them off and creating the opportunity of getting at their heavier troops not all of who were top quality. We managed to break the French pikes with javelin skirmishing, and got our knights into their unstaked English archers without taking critical damage (which is enough) - and by game end we had won a couple of uneven knight melees against the odds as well. Exciting game. 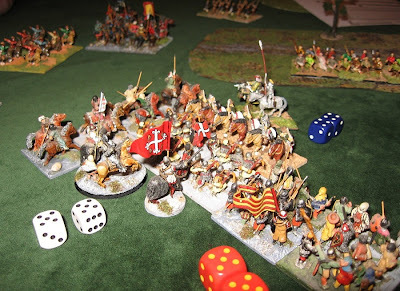 All told, we came up 1 attrition point short of routing the army (although I think we made a couple of mistakes towards the end which flattered the Aragonese) - nevertheless we got a pretty emphatic result that needed maybe one more turn to complete. Perhaps the others had been right to go for their cabbage patch games! Thanks to all the players, back-slappers and comrades in arms. A very enjoyable visit to Usk as usual. 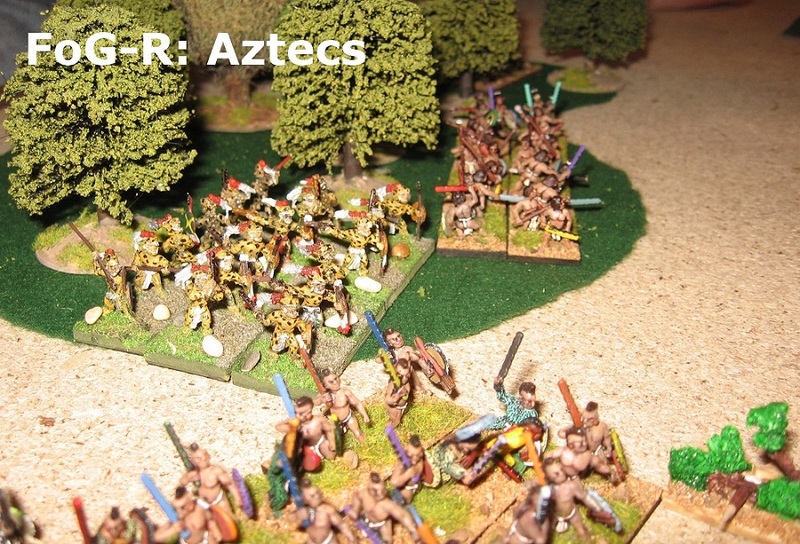 I last played that Aztec army back at a Loughborough period Britcon (I think I was invading Mexico with a army of Hohenstauffen Sicilian adventurers if that makes any sense - which I suspect it won't) ... great paint job, plus imaginative baggage and a pyramid temple. Worth another look of course. Of the ancients categories, honours went to Dave Ruddock and Ian Stewart in the FoG-AM and to Dave Madigan and Chris Smith in the DBM. Us? Oh, we came 9th out of 20 teams with 44 points in the end. Just ahead of the game, and with a handful of dead generals to crow about. I will post a link to the results when I get the information. 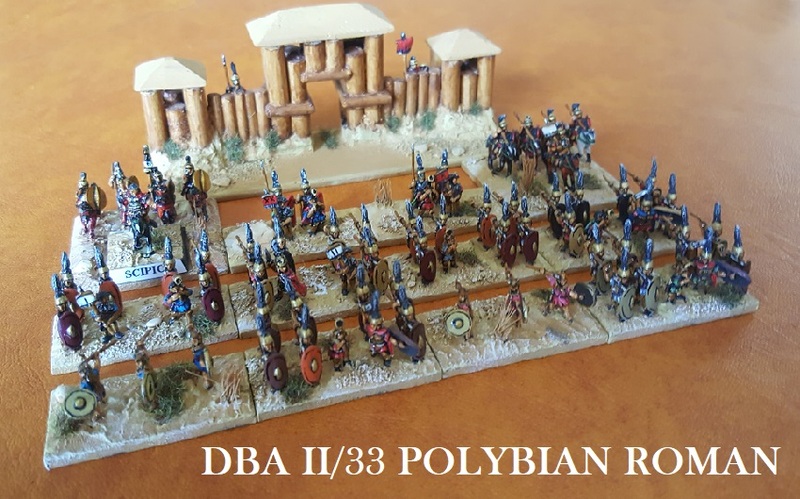 But hopefully we will see you at Vapnartak next week where I will be doing an Egyptian game with those pretty classic flats - but in an up-to-date twist, I'm trying them out for DBA and giving you a taste of the new version 3.